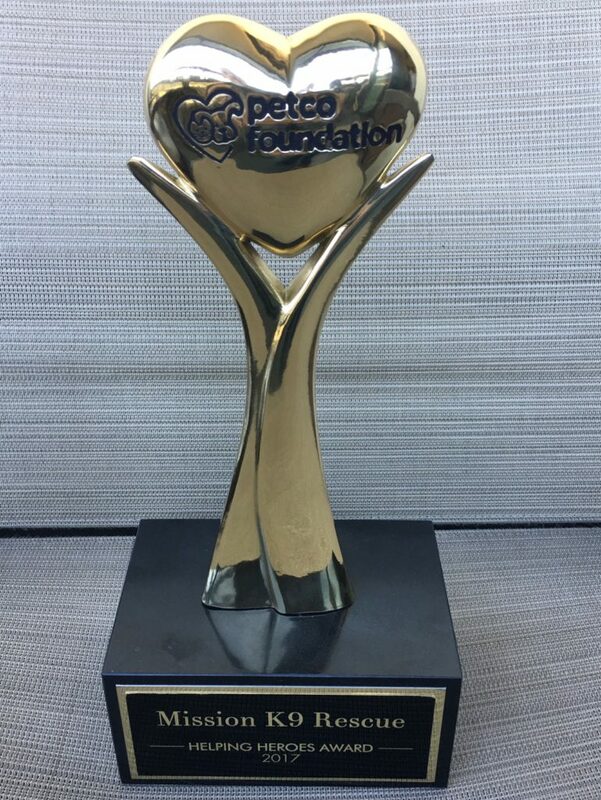 San Diego, CA (4/19/2017) – And the crowd went wild as MWD Rossi barked at the PERFECT TIME as Mission K9 Rescue Co Founders were presented with the “Helping Heroes” award by the PETCO Foundation in recognition of our work with Military, Police, and Contract Working Dogs. We’ve accomplished a lot in 4 years and we’re proud of the work we do for the dogs! We couldn’t do it without our Facebook friends, our donors,The United States War Dogs Association and the incredible Petco Foundation! All of you have made what we do possible, and together we know that there is more good to come! Mission K9 Rescue is a dedicated team that shares your passion for the retired, retiring and contract working dogs that we serve. Our organization is funded solely through the monetary support of individuals that share our passion and respect for Working Dogs. Your support is deeply appreciated and is paramount to our ability to keep “Serving America’s Working Dogs”. There are a variety of ways to make donations to Mission K9 Rescue. No matter how big or small, every donation counts with Mission K9 Rescue.